On August 1, the moon appears to the right (west) of Spica. Most people know that the moon orbits the Earth once a month, but they typically have no visual confirmation of this motion. Over the next week, skywatchers have the chance to see moon's motion with their own eyes. If you look at the western night skyan hour or so after sunset, you cannot fail to see three bright objects in a row, weather permitting. 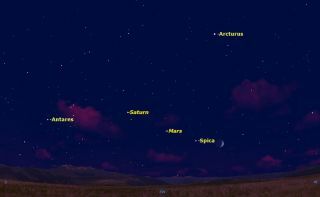 For observers in the Northern Hemisphere, these objects are (from right to left) the star Spica in the constellation Virgo, the planet Mars and the planet Saturn. Tonight (Aug. 1): The five-day-old crescent moon appears just to the right of Spica. On August 2, the moon has moved to lie between Spica and Mars. Saturday (Aug. 2): The moon has moved 12 degrees to the left (eastward), and lies between Spica and Mars. Note: Your closed fist held out at arm's length covers a 10-degree patch of the night sky. On August 3, the moon lies between Mars and Saturn. On August 4, the moon lies between Saturn and Antares. Tuesday (Aug. 5): The moon is directly above (to the north of) the star Antares. On August 5, the moon is to the north of Antares. Besides the motion of the moon, there are several other things to notice during these early August nights. First, the phase of the moon is growing from each night to the next. On Aug. 1, the moon is five days old and 30-percent illuminated. But by Aug. 5, moon is nine days old and 70-percent illuminated. So in only four nights, the moon has become more than twice as bright, lighting up the landscape. A subtler change is that the background stars and planets have all moved slightly downwards and to the right. That's because of the Earth's own movement around the sun. Finally, if you look really closely, you'll see that the position of Mars has shifted slightly over four days. It is getting closer to Saturn and farther from Spica. Saturn is far from Earth, and doesn’t appear to move much, but Mars, much closer to Earth, moves quite rapidly from right to left, while the stars and Saturn are moving from left to right. Mars will actually appear to pass Saturn by the end of the month. All of these movements are described here as seen by observers in the Northern Hemisphere. Southern observers will see similar movements, but in a different direction. For example, the moon will be moving upward in the twilight sky. These movements of the moon, planets, and stars provide an excellent opportunity for photography, and we always welcome your contributions. Editor's note: If you capture an amazing photo of the night sky in August and want to share it for a possible photo story or gallery, send images and comments in to managing editor Tariq Malik at: tmalik@space.com.